Use the battery cables that people RELY on every day! Spartan Power 1/0 1 Foot Battery Cable Sets come professionally assembled with 5/16" or 3/8" ring terminals and are perfect for connecting up to a 3500 watt power inverter to a battery bank! You can also use Spartan Power battery cables for replacement automotive, motorcycle, RV, & other vehicle wiring applications, grounding cables, golf cart wiring, car audio stereo amplifiers, solar and many other applications where pure copper is recommended. These cable sets come with Adhesive Lined Irradiated Polyolefin (PO) heat shrink, which is exceptionally resistant to water, fungus, and UV light. These quality cable sets are guaranteed by both Inverters R Us & Spartan Power to provide you with reliable current. New to Amazon! 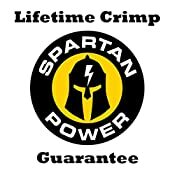 MADE IN THE USA - Lifetime Crimp Warranty! 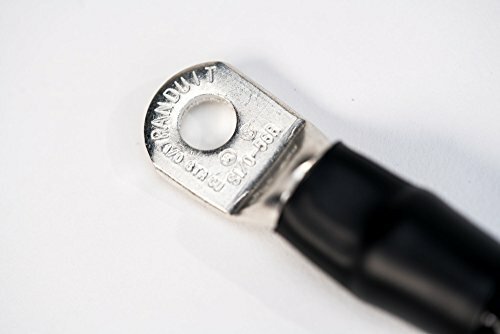 We believe these are the best 1/0 AWG battery cables on the market today, if you ever experience a crimp failure, Spartan Power will gladly repair your cables for free! Each battery cable set is professionally cut, crimped and heat shrunk with the utmost quality & precision by skilled craftsman in Reno, NV who take pride in their work. Don't get burned by cheap cables and components. Buy Quality, Buy American! UL 1232/1284/1338 600V or 10269 1000V Approved. VW-1 & moisture resistant, Polyvinylchloride (PVC) insulation. Perfect for use with a Spartan Power 150A or 200A Fuse Kit (ASIN B06Y4C6DQR or B06XW27WMD). Spartan Power also has 4/0 AWG (ASIN B071KQFQ3M) and 4 AWG (ASIN B06XFPK2J7) Battery Cables available. Includes one red (positive) 1/0 gauge cable and one black (negative) 1/0 gauge cable with 5/16 lugs assembled on both ends.